A camel’s hump is actually a mound of fat that acts as a food reserve in times when food is not available. There are two main types of camels. One is the dromedary, or one-humped camel, which inhabits the Middle East and the Horn of Africa; and the bactrian, or two-humped camel, which can be found in Central Asia. Both of these species are expected to survive high temperatures and dry environments where food and water is scarce. Contrary to the popular belief that the camels’ hump is used to store water, it is actually not.The hump is actually a lump of fat mixed with fatty tissue that is used when food is not available. 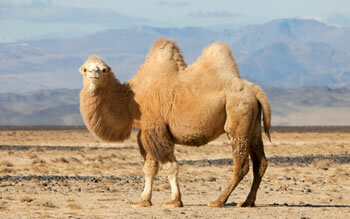 When well-fed, the camel’s hump is upright and can weigh as much as 80 pounds or 35 kilograms. However if the camel has not fed, the hump with deflate and fall over a side like folded skin. This is similar to how humans store fat mixed with muscle tissue in a layer underneath the skin, this purpose is completed by the hump. Camels can survive up to 2 weeks without food. In terms of water, a camel drinks about 5 gallons (20 liters) of water a day in the summer. However, it can also lose up to 25 gallons (100 liters) of water from its body tissues without suffering any side effects. In addition to food, the camel’s body is also equipped to retain water and conserve it. Their body can handle large – body temperature swings. Camels play an important part to the culture and even providing items such as meat, hair and transport. They are one of the best transport through desert or dry areas because of their ability to survive for long periods without water and food.